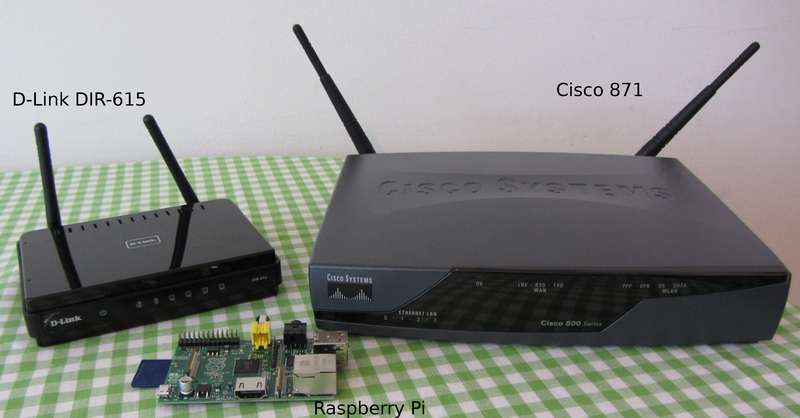 This blogpost will describe the steps required to setup such a system from scratch, using a Raspberry Pi (and of course a wireless router/access point). Why a Raspberry Pi? Simply because it uses a lot less power compared to a “normal” computer (compare that 5V, 1A phone charger to the 400+W power supply of your PC), meaning you should get less of a shock when you get that regular letter from your electricity supplier. Having said that, this tutorial should work for most Linux machines, there isn’t anything ARM specific here. WARNING: This article discusses network security topics. Please do not apply this to a production environment unless you fully understand what’s going on, have read up on the topics elsewhere and are willing to take responsibility for it. I’ll try to discuss and/or point out security-related issues I’m aware of, but if something goes wrong and somebody hacks into your network, you have been warned. Brief introduction to 802.1X, RADIUS & EAP. I’ll try to explain how all these things fit together in a simple way. It may not be 100% correct everywhere, but it should give you an understanding of what’s going on. If you need to know more (which I thoroughly recommend if you’re thinking about deploying this in a production environment, such as at work! ), there is plenty of literature available. Diagram showing protocols involved in wired 802.1X authentication, by Arran Cudbard-Bell, from Wikipedia. For the purpose of this blogpost the Supplicant will be a wireless device and the authenticator will be your wireless access point or router. The basic idea is that you associate with your wireless network first (click on the wireless network name in your wireless utility), but that you need to be authenticated (you type in your username/password) before you are authorized to access the network (and browse the web). To make this work, you need three systems – a wireless laptop/smartphone/etc (the supplicant), an authenticator (a wireless access point (AP) or router) and a server that stores your credentials (the Raspberry Pi). Now you somehow need to tell the authentication server who you are and what your password is, before you are actually allowed to send traffic on the network, and without broadcasting your username and password in clear text on the wireless network for everyone to see. The solution to this is that the authenticator will only forward 802.1X traffic to the authentication server until you’ve been authorized, and ideally you encrypt this traffic to prevent anyone from sniffing your username and password. As you can see from the diagram above, the Extensible Authentication Protocol (EAP) is used for communicating all the way from the user’s laptop to the authentication server (it transports your username and password), whereas RADIUS is only used between the authenticator and the authentication server. 802.1X defines how EAP is used over ethernet and wireless networks. 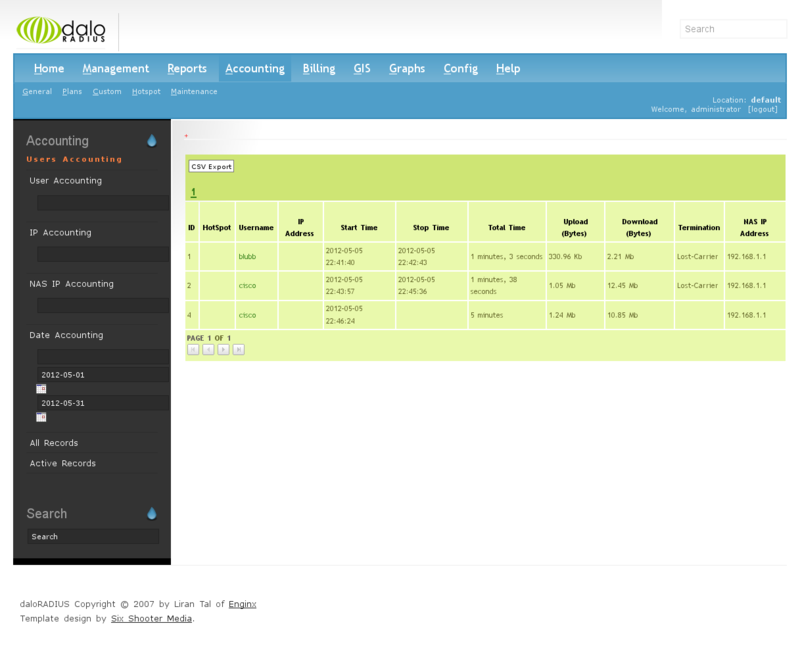 RADIUS also supports sending “accounting” data, such as telling a server how much you’ve been downloading. A Raspberry Pi – or another computer running some flavour of Linux. There exist RADIUS servers that run on Windows as well, but you’ll need to look elsewhere for tutorials on those. A nice access point (AP) or wireless router, i.e. one that supports RADIUS and 802.1X. A wireless laptop/phone/iPod or some other device that supports WPA2 enterprise. The PS3 unfortunately doesn’t ;). Some understanding of Linux and networking. I’m assuming that you’ll be using a Raspberry Pi for this, running Arch Linux (it should be pretty similar on Debian though, except you’ll need to use apt-get to download the packages, which might have slightly different names). I’ll be using a Cisco 871W router (which has now been End-of-Life’d 🙁 ), though the tutorial should work on “similar-ish” Cisco devices running IOS (I recommend checking before buying). I’ve also tested this on a D-Link DIR-615. I’ll guide you through setting up the various components one by one in an incremental way, testing the setup as we go along: first, we’ll setup FreeRADIUS with “hardcoded” user & cleartext password, then the wireless network. Once that works, we’ll configure a MySQL database for storing usernames, passwords and accounting data, setup the DaloRADIUS web-GUI and point FreeRADIUS to the database. I’ll finish off with discussing some further points about security, give some debugging tips and point you to some further information (so feel free to scroll to the end if you get stuck!). Many of the files and folders in the FreeRADIUS installation directory are owned by root and cannot be cd’ed or viewed by non-root users (this has good reasons). Normally I would recommend running as much as possible under a non-privileged user and using sudo only where necessary, but you’ll probably find yourself needing to do a lot as root, so switching to root may be convenient. Please be careful if you do so. cd into /etc/raddb/certs and run ‘./bootstrap’. This will generate the test certificates. Start FreeRADIUS (in debugging mode). You should see “Ready to process requests.” at the end of the output! If something else happens, take a look at the output of your running ‘radiusd -X’ process and see if that gives any clues. nastype = cisco # see the localhost example for other values. These changes will require a restart of radiusd. You can just kill the process with CTRL+C. use EAP rather than PSK. The shared secret is whatever you set <myultrasecretsecret> to. The D-Link DIR-615 (H/W Ver. D4) stock firmware unfortunately only supports authentication/authorization, but not RADIUS accounting 🙁 – maybe I should experiment with DD-WRT. Screenshot of the D-Link DIR-615 wireless setup menu, showing how to configure a WPA2 Enterprise wireless network. The <radius source interface> is the interface on which the IP address is configured that your router uses to talk to FreeRADIUS (in my case the one with 192.168.1.1/24). Just click on the airport icon, select your network and enter your username and password. If you’re asked to accept an untrusted certificate feel free to do so; this is the test certificate we generated earlier. You probably know how to do this already. I recommend using networkmanager if in doubt. Click “add” and choose “Manually connect to a wireless network”. 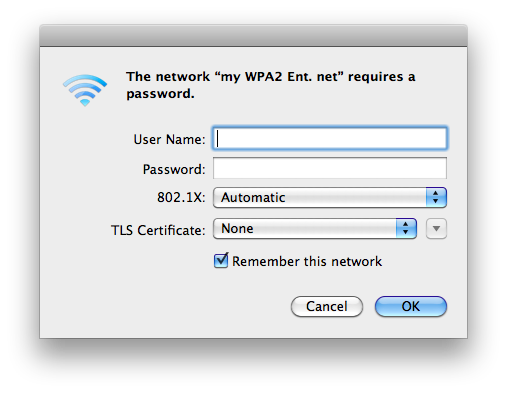 Enter your SSID, choose WPA2-Enterprise as security type, AES as encryption type. Click on “Change connection settings”. Go to the “Security” tab. Click on ‘Settings’ next to “Choose a network authentication method” (you can leave that set to PEAP). Untick “Validate server certificate” (the test certificate will fail the validation). Under “Select authentication method”, click on “Configure” and untick “When connecting: Automatically use my Windows logon name and password (and domain if any)”. Back on the “Security” tab of the “wireless networks properties”, click on the “Advanced settings” button. Tick “specify authentication mode” and select “user or computer authentication”, and click on the “save credentials” button. Enter your username/password. The connection should now succeed. Install Apache, MySQL and PHP. PHPMyAdmin (and php-mycrypt) are optional if you’re happy using the MySQL command line. Edit /etc/httpd/conf/httpd.conf – change your server admin email address and the like, and follow the instructions on how to enable PHP from the ArchLinux wiki entry on LAMP. I recommend you follow the basics first, make sure you test your php installation with the <?php phpinfo() ?> script and then activate GD. If you want your webserver to be accessible from the outside, you’ll need to update /etc/hosts.allow by adding e.g. “httpd: 192.168.1.0/24” to allow connections from any machine with an IP address of the form 192.168.1.*. Please adjust this according to your needs. Optional: follow the following instructions for setting up PHPMyAdmin. Log into PHPMyAdmin (or using the mysql CLI), create a database called “radius” as well as two user accounts: “freeradius” and “daloradius”. Grant them both all privileges on the radius DB (I recommend you fine-tune these permissions later). Download the latest DaloRADIUS version to your Raspberry Pi. You may want to get the direct link and use wget/curl to download it, if you didn’t install any desktop environment on your Raspberry Pi. Edit /srv/http/daloradius/library/daloradius.conf.php, and update the database connection credentials so that they match the ones you set up earlier. Login to your daloRADIUS installation (http://your-raspberry-pi-ip/daloradius) with the username “administrator” and password “radius”. Make sure the login succeds. If it doesn’t, you’ve most likely got a problem with your database connection – check that MySQL is running, that you installed the required PHP libraries and that /srv/http/daloradius/library/daloradius.conf.php contains the correct connection credentials. Under Management->Users, add a new test user. Use a cleartext password again, just to make troubleshooting easier. Edit /etc/raddb/sql.conf so that the database connection parameters (username, password) match with what you setup earlier. In /etc/raddb/sites-enabled/inner-tunnel, uncomment the ‘sql’ lines in the authorize and post-auth sections. In the session section, comment “radutmp” and uncomment “sql”. This is so that tunneled authentication mechanisms (such as TTLS) also use the MySQL database. Add the details of your NAS (this is the authenticator, i.e. your router/wireless Access Point) into the radius database. You’ll find these settings under Management->Nas->Add NAS. Define your NAS as a “hotspot”, I think DaloRADIUS thinks of everything as a hotspot. Cisco devices do not seem to send IP address information in network accounting packets, at least not with my setup. It is however possible to send DHCP server accounting information to a radius server, so you can configure that (add ‘accounting …’ to your DHCP pool). Unfortunately, this information will have a different accounting session ID to the network accounting session ID, so you’ll need to correlate the information yourself (this is outside the scope of this tutorial). Last but not least… Securing it. On Arch Linux, the radiusd user and group are created for Freeradius. It’s a good idea not to run Freeradius as root (remember, it can receive traffic from unauthenticated wireless clients, i.e. anybody near your antennas!). You may need to chown the certs directory though, and make sure that the permissions of /var/run/radiusd and /var/log/radius are correct. To make Freeradius run under the radiusd user and group, uncomment the “user = “and “group = ” lines in /etc/raddb/radiusd.conf and set them equal to “radiusd” rather than “radius”. Store passwords in a responsible manner. The EAP method/password storage compatibility matrix @ deployingradius.com however paints a pretty scary picture; I’m inclined to go with TTLS using PAP or MSCHAPv2 for inner authentication, storing the passwords with SHA sums in the DB (or ntlm hashes in case of MSCHAPv2). The easiest way to create a user with a hashed password is to just select the hashing method from the drop-down menu DaloRADIUS gives you when creating a user, and then to copy/paste the hash of the password into the text field. Make sure you do some negative testing as well, i.e. check that logging in with invalid credentials fails! Congratulations, you should now have a working WPA2 Enterprise wireless network! Configuring the Cisco 871W wireless router: SOHO setup @techrepublic – I think I looked at this almost a year ago for some bits of config. Downloading the configuration Excel template unfortunately requires you to register, but one of the comments thankfully contains some bits of config that might be useful, e.g. for setting up a bridge between your wireless and wired network so that they are on the same subnet. Run “radiusd -X” on the Raspberry Pi. Check the logs on your wireless client (the supplicant). I am currently a Cisco employee, and the views expressed on this blog are mine and do not necessarily reflect the views of Cisco. Great tutorial. It work with Cisco 1841 with HWIC-AP. Thank you for the feedback, I’m glad you got it to work! I just want to thank you. It to people like you that make me love humanity, thanks for your work. I will try the setup when i have my pi. I don’t want to be greedy, but do you have a SD-Card image from your project? This would save a lot of time! In anyway thanks for sharing this great information! I unfortunately don’t have an SD card image from my project (I’ve re-formatted my Raspberry Pi since I did this). I did think that this would be a good opportunity for me to learn how to use Chef/Puppet and put together a chef recipe/puppet manifest which can be used to automatically set this up. The next time I set this up I’ll do it with one of those automation tools, or at least script-ify the installation. How good is the performance on the Rasberry Pi? I’ve been looking to have a dedicated Radius Server, but couldn’t think to spend the money and build my own hardware, and I didn’t have any “spare” computers that I could use for just the server. As in, if you have less than 5 users/devices on at the same time on your network, is the performance badly affected, or is there any affect on the actual err browsing experience for those on the network? Also, could you use the Rasberry Pi for anything else once it became a Radius server? Like on Arch, could you create and install extra modules to the kernel on to the Pi, like a moderately sized project, maybe even running a little LCD. My second question is, on the Pi once you’re running the server, can you still operate the more Microcontroller portions of the Pi, like send data through SPI or I2C, without it affecting the operation of the server? Excellent question. The Raspberry Pi doesn’t act as a wireless controller, it just acts as an authentication server. Once your wireless client has been authenticated, traffic goes directly from the client via the router/AP to the destination, it doesn’t have to pass through the FreeRADIUS server. Because of that, I’d expect the steady-state load to be fairly minimal, it should only consist of periodic accounting requests (if you’ve set that up) and perhaps the occasional authentication event when a device goes to sleep or goes out of range and comes back into range. I don’t remember what the steady-state RAM requirements were (especially if you setup Apache+MySQL for DaloRADIUS), but I used a 256MB Raspberry Pi and I could at least let it control a 7-segment display at the same time, so I think you should be OK :). Of course it depends a bit what you do with your LCD display, playing CPU and RAM intensive games on a high-res LCD display would probably push the Pi to its’ limits, but I suspect that’s the case whether or not you run FreeRADIUS on it. Periodically displaying some text on an 18×2 display shouldn’t be an issue though. Just to let you know: meanwhile one has to switch additonally from “mysql” to “mysqli” in daloradius.conf.php. Else the “DB Error: extension not found” is shown only on login. And the freeradius configuration to enable mysql lookup is outdated, is written for using v2, actually I tried to get things up and running with v3.0.6. Following https://lalitvc.wordpress.com/2014/07/03/freeradius-3-0-x-installation-and-configuration-with-mysql/ made things working for me. I already had Rasbian installed on my pi so I used that instead of switching. Works a treat. Even got Radius VLans working! Using 3 different routers… EA3500 Linksys firmware, EA3500 Openwrt and Unifi AP AC.